Nox woke to the sound of the water clock by her bed chiming the hour. It took her a moment to remember why the room was still pitch black at 7am. She sighed, swung her feet over the edge of the bed and felt around with her toes until she found her slippers. It was foolish to think she would wake up one morning and have her sight back. Even so, she could not quite squash the faint bit of hope that her mother’s spell might unravel over time. Today was not to be the day, however. Her clothes were laid out across a nearby chair, a simple skirt and chemise that could be pulled on with a minimum of fuss. She navigated slowly around the room, guided by small puffs of air from casting marks her father had placed on all the furniture. Colder drafts marked the left side, warmer ones on the right and anything fragile would whistle a warning if she got too close. “I was going to say inappropriate,” Nox said, with an impish grin. Nox laughed with him but her smile faded a little. As one, they moved to look out the floor-length windows that ran along the far end of her suite. They were both thinking about their aborted attempt to go visit Loki the previous day. The mountains in the distance no longer glowed, but a steady stream of smoke still rose from their peaks in ashen plumes. “Were you able to see what triggered mother’s spell again?” Nox asked. The mountain was living thing, a vast earthen beast with molten rock in its veins. Loki held it in chains made of scarlet light, but it held him as well, bearing down on him till he thought his bones would crack from the weight. Its foul breath polluted the air, choking him even as he pulled tighter on the chains to choke it into submission. Pain roused him from the nightmare, but he woke to find his dream a reality. Lava had flowed in around him, nearly filling the chamber. Only his head and part of his chest were free, and his arms strained backwards as if he had tried to hold back the flow with his bare hands. He had fallen asleep and nearly lost control of the casting. Fatigue sapped his strength. He had no idea how long he had been down here, the days blurring in the endless flow of energy he channeled to lull the mountain into dormancy. He was beginning to forget why he even bothered. 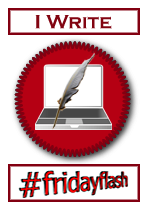 This flashfic is part of an ongoing web serial, updated regularly as a part of #fridayflash on twitter. If you are new to Nox and Grimm, you can Click Here to read from the beginning. It did not seem right to Grimm that the sun was still shining, or that the wind was laden only with the heady scent of flowers. There should have been tempests, he thought bitterly. What was a pronouncement of doom without a bit of rain and thunder to accompany it? Nox sat on the garden bench next to him, idly twirling a lock of hair between her fingers while he described Death’s visit. “You are taking this awfully well,” Grimm said. “Nox, this won’t go away by ignoring it,” Grimm scolded. Death’s sword started to hum from where it sat, propped up against Grimm’s leg. Nox turned to look at him, her eyes the same metallic grey as the blade. ::Why do you hesitate, guardian? :: she said. The change in her voice stood Grimm’s hair on end. The sword hummed in time with her words, and Grimm realized it was using her as a proxy to talk to him. Part of him did want it. There were times when he was desperately tired, having lived so long beyond his natural lifespan. But how could he tell Nox that her life had just ended? She might never see Loki again, not until he took his last walk down the Long Road and even then his shade would only pass her by. Grimm had spent centuries with nothing left but heartache and regret. That was not a fate he was willing to share with anyone. “I am sorry,” he said, and sheathed the sword in one smooth, practiced motion. “The price for peace is too high.” He had no idea what he was going to do, but until he gave her the sword the deal was not done. That was when the idea hit him. It was crazy. There would quite literally be Hel to pay for it. But it was the only way he could think of to keep them both in the mortal realms. Grimm did not have to ask Nox what she wanted to do; he already knew what her answer would be. “We’ll take our chances,” he said, and cast the enchantment that would put the sword forever beyond her reach. “Welcome back short-stuff,” Grimm said, relieved to hear her sounding like her feisty old self again. “So where is the sword now?” she asked. “Somewhere between time and space, until I shapeshift back into a man. Which I have no plans of doing any time soon,” Grimm said. “At least we won’t be in it alone,” he said. “Well, as long as we’re sailing into trouble you should at least be allowed to see it coming. Have a look through my eyes, little one.” His thoughts reached out to hers and they joined together like clasped hands. A look of profound joy lit up Nox’s face as the world opened up before her, and her eyes welled up with tears. She hugged him and buried her face in the shaggy fur of his ruff. “You’re welcome,” Grimm said, more at peace with his fate then he had been for a very long time. Posted by techtigger in short story, writing. Grimm walked with Nox around a small formal garden that graced one of the courtyards scattered throughout the mansion. He carefully guided her steps with a hand under her elbow, and sent a small Air casting whirling ahead of them to clear the path of anything that might cause her to stumble. “Of course I do,” she said. Grimm waited for her nod, and drew his sword. He knelt before her with it held point down, and placed her hands over his on the pommel. He focused on hanging the casting marks in the air, only murmuring the appropriate responses in the right places. Their soul bond hummed in sympathy, a silent chord that sang through both of their minds. Everything stopped, the breeze, the butterflies hovering mid-flutter above the flowers. Even Nox had frozen in place, unmoving as a statue. An empty grey suddenly tinged everything, and Grimm got a sinking feeling in his stomach. Death waited on the far side of the garden. The Long Road stretched out behind him into the grey haze, and the sword he had given Grimm to hunt the Shadowkin was in his hand. Death ignored Grimm, looking over his shoulder at Nox. The pieces fell into place in Grimm’s mind. Hel needed its guardian. Grimm had been soul-bound to the last one, and ended up taking his place. Now Nox was soul-bound to him. But the world had already shifted and Grimm found himself kneeling in front of Nox again. The sword between them now was Death’s.